Safety of being flame retardant and foam free! Removable pad is machine washable! The Safe Surround Changing Pad gives the comfort of a regular change pad, but with the safety of being flame retardant and foam free! This change pad meets flammability standards without using additional chemicals. 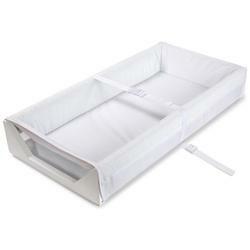 The soft surface is comfortable for baby, and the high sides help prevent infants rolling over. Wipes clean. Fits normal changing tables and changing pad cover. Removable pad is machine washable!